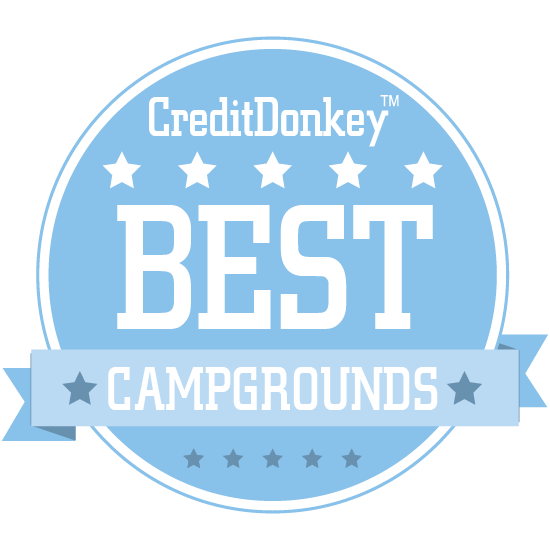 Winners of the CreditDonkey Best Campgrounds Award have been announced. Find the perfect spot to pitch your tent, park your RV, or recharge in luxury. Camping isn't what it used to be. If you want to reconnect with nature, you have a ton of options. You could keep it simple and show up at a campground with your station wagon and a set-up tent, or you can opt for glamping and get all the amenities of camping and resort living - without the work involved. Yurts, guided tours, structured activity schedules, pools, volleyball matches, and even dog parks can be yours for a weekend or longer. With so many choices, though, the toughest part about camping these days is not so much about how figuring out how to start your own fire but deciding where you should spend your precious vacation hours. 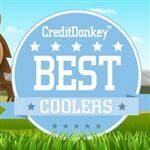 After all, at CreditDonkey, we know you work hard for your money, and we want it to go as far as possible for you when you do get a break. And the worst thing that can happen is you put up funds for a campground reservation and find out the campground you thought would be so great is actually a bust. We're making both your search and decision easier with this list of the best campgrounds in 2017. You'll find campgrounds that cater specifically to people who want to travel with their dogs, epic family vacation spots that rival small towns, as well as luxurious spots that have hot tubs (like we said, people's idea of "camping" has certainly changed!). Don't worry, we've also found spots that are for the more traditional types - campers who do want to rough it but also like the safety (and clean bathrooms) that campgrounds have to offer over dark nights in the isolated woods. No matter what you're looking for, here is a list of some of the most magical and unique accommodations for any camping experience. Related: What Are Airline Miles? Glamping is an experience that should be tried by everyone at some point in their lives; there is no better way to take the best parts of camping and the best parts of a luxury hotel and combine them into one unique way to stay that will create memories for a lifetime. The Finger Lakes region of New York is filled with culture, hiking trails, lakes, rivers and waterfalls for a full day of exploring and relaxation. Then come back to beautiful lighting dangling over your safari tent, where a warm, king-sized bed awaits. Your cabin has every amenity you could need while you enjoy every minute of warm summer nights. 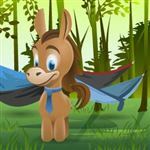 Why Firelight Camps is a Top Campground: The best parts of campgrounds and high quality hotels. Games, fire pits, restaurant, bar, room service and everything that the Finger Lakes region of New York has to offer. It's a great place for weddings, events, family trips, romantic escapes or group adventures. A large, welcoming canopy ushers you into this epic family campground along the beaches of South Carolina. This is the kind of place where kids will beg that you take them for a long vacation every summer - and you'll be happy to oblige. With over 859 campsites that can be leased for your RV or tent, and over 2,560 annual lease sites featuring beach house rentals, all sitting on 310 oceanfront acres with plenty of beachfront access, Ocean Lakes Family Campground is one of the biggest campgrounds in the entire country. Its size doesn't sacrifice its quality, either. It's more of a small town that offers endless events and activities for guests of any age. Why Ocean Lakes Family Campground is a Top Campground: The list is nearly endless. Whether you are there for a family trip or a shoulder-season escape, the beach and campgrounds have it all: bike rentals, live music, events, church, family fun center that features mini golf and a water park, plus everything the beach and ocean have to offer. You will never run out of things to do at Ocean Lakes. The San Juan Islands are unlike anywhere else in the United States. Wake up, breath deep and say hello to the mellow island vibe. You will be surrounded by extraordinary wildlife and the waters of the San Juan Islands are home to an abundant marine life population. The island is well known for whale watching, the resident pods of Orca Whales can be seen from water and land. Hiking trails can be found throughout the island overlooking a seemingly endless number of pristine islands in the Pacific Northwest. If that sounds like your dream vacation, then Lakedale Resort at Three Lakes has everything you could want in a camping trip. Why Lakedale Resort at Three Lakes is a Top Campground: Offering everything from a 10-room hotel to picture-perfect log cabins and glamping tents that will keep you dry while you hear rain pattering on the canvas. Lakedale combines the best of camping and resort amenities. 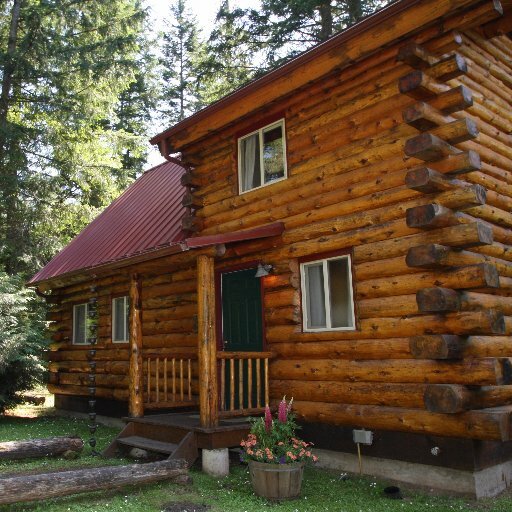 You can stay in a fully-stocked log cabin replete with kitchen and living room, live inside a one-of-a-kind canvas cabin or cottage, or bring your own camping gear. You’ll have the best of the Pacific Northwest at your fingertips with accommodations unlike anywhere else in the country. This camping and kayak resort is the best option for Chicago's city dwellers and suburban residents who are looking for a nearby nature escape that is unlike anywhere else in the area. 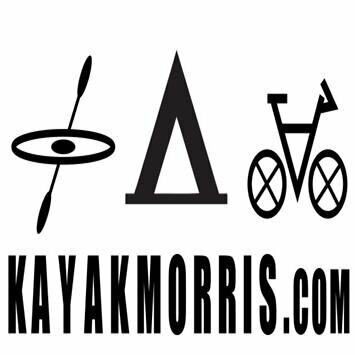 With tent sites, fire grills, excellent cuisine and a riverside location less than an hour from the country's third-largest city, Kayak Morris specializes in kayak tours and trips for any experience level. Whether it's your first time cruising down the river or you are a regular, there are few other campsites this close to a city that let you wake up in your tent, hop in your kayak and cruise down a river as soon as you start your day. It's a summer paradise for families and friends who want to get away without having to travel very far at all. Why Kayak Morris Campground is a Top Campground: Kayak lessons, tours and rentals; riverfront camping location; less than an hour from Chicago; excellent food and grilling options. 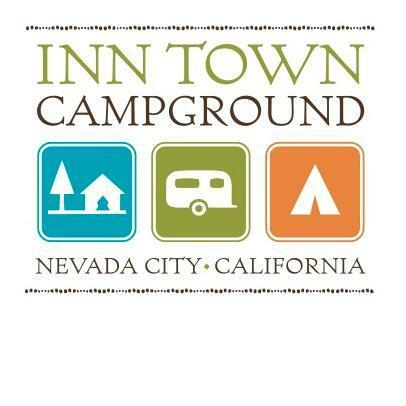 Surrounded by pines and cedars along the same Sierra Nevada mountain range that holds some of the nation's greatest natural attractions, the Inn Town Campground is a glamping paradise. Whether you are looking for an RV site, camping plot or want a romantic escape or family trip to one of their canvas glamping sites, Inn Town is a spectacular option for every kind of camper. With a location midway between Sacramento and Lake Tahoe, it's a perfect mix of perfect natural beauty with the kind of camping that's right for you. Bring your airstream trailer, set up camp, make new friends or reconnect with old ones - this is California camping at its best. Located at 78 North Holiday Blvd. in Santa Claus, Indiana, Lake Rudolph Campground & RV Resort provides what's great about the holiday season from May through October. It's an amazing spot for families, kids of all ages, and lovers of the outdoors, theme parks and water parks. That’s thanks to its location adjacent to Holiday World Theme Park & Splashin' Safari Water Park. Home to some of the best roller coasters and water coasters in the country, like Thunderbird, Voyage, and Wildebeest, it is a great family park with rides and thrills for all ages. Why Lake Rudolph Campground & RV Resort is a Top Campground: Aside from streets with names like Snowball, Blitzen, Comet, Snowflake, Tinsel and Jolly, Lake Rudolph offers over 500 camp sites and unique vacation rentals including cabins, cottages and rental RVs. It even features its very own water park called Santa’s SplashDown and many other family amenities including playgrounds, game rooms, basketball courts, fishing, paddleboats, free shuttle service and golf car rentals. Where: Santa Claus, IN, along the border of Indiana and Kentucky, around an hour west of Louisville, KY.
Snug Harbor begs for a family summer vacation. With its riverfront property and small beachhead, it is unlike any campground in Northern California. Kids can spend the entirety of a hot summer day playing in the water while parents relax in the sun and get some much-needed R 'n R for themselves. With cottage, RV and campground reservations available, this unique little pocket allows drivers to bring their car on a small ferry or cruise through the charming nearby town of Walnut Grove. Harken back to a time of fur trappers, traders and explorers. You can get a full, authentic Adirondacks experience in upstate New York replete with canvas tents, rough sawn open air structures semblance of the old logging camps, amazing food and drink, and an unmatched wilderness escape without leaving the country. Accomodations include warm and comfortable beds so you can connect with nature without being exposed to the elements. Whether your idea of vacation is fun-filled outdoor activities or kicking back and looking up at the stars, Camp Orenda is one of the best wilderness resorts in the northeast. Why Camp Orenda is a Top Campground: Guests get to enjoy backcountry cuisine with rustic, fine dining that's prepared on-site. They will work with you to design the trip and adventure that's right for you. Thanks to the 40 acres of hillside wilderness, they can craft the perfect hike, kayaking trip or relaxing stay for you, your loved one or your entire family. This summer activity mecca for Midwestern families has an amazing and unique feature in the middle of its forest location. That's thanks to the small lake surrounded by beach on all sides with every water activity imaginable available to kids. Whether it's the water games, slide, obstacles courses, relaxing by the beach, playing in the lake, swimming all day or just taking it easy in the sun, there is no better place in the surrounding areas for families to escape during the summer. Camp Soaring Eagle is a special and magical place that caters to children with extra health needs - and it doesn't charge a single penny for young campers to attend. An amazing non-profit that aims to ensure kids with medical needs can still have the kind of special summer camp experience that all children deserve, Camp Soaring Eagle offers a medically-safe camp to kids ages 6-15 with serious illnesses. There are very few places that offer such an experience, but they are committed to being the best of its kind for kids who deserve to go to camp but otherwise wouldn't have the opportunity. Imagine you are wrapped up in the warmth of the Savannah but with top-tier luxury. A beautiful sun cover drapes overhead and you enjoy the rolling plains from your lush, king-sized bed, hot tub or deck chairs. And even more amazing is that you don't have to travel across an ocean for this kind of experience and solitude. It's waiting for you in Texas. Sinya on Lone Man Creek is luxury glamping for two. It is the most romantic retreat of your life, combining perfect solitude with a high-end resort. Why Sinya on Lone Man Creek is a Top Campground: With furnishings, chairs and couches that invite you to take the greatest nap of your life, hardwood floors, the lushest bed of any hotel, bathtub and hot tub, Sinya on Lone Man Creek is luxury at its best. It combines glamping from top-tier African safari accommodations with the fanciest American hotels for an experience that is truly unlike anything on earth. Ever thought of spending a night in a motel located in one of the largest caves in the country? Grand Canyon Caverns can make that a reality with one of the most unique experiences you'll ever find. Located not far from the Grand Canyon and Supai Falls, these underground suites and bedrooms offer everything you'd want while you travel but in one of the most incredible locations you can imagine. 4 Paws Kingdom is exactly what it sounds like. 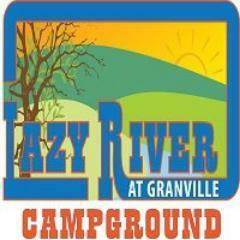 This place is paradise for you and your furry best friend - it's the best campground for dogs in the country. Whether it is obstacle courses, play areas, endless running room or swimming, your dog will find everything he or she loves while you get to treat yourself to a relaxing vacation. Anything you can imagine your pet loving is at 4 Paws, and it's still a great camping option for two-legged adventurers as well. Why Four Paws Kingdom Campground is a Top Campground: Multiple fully-fenced, off-leash dog parks with a massive free run areas. Playgrounds for dogs of different sizes, swimming ponds, agility courses and plenty of treats and classes for dogs. For two-legged guests, you'll find RV sites, tent sites, fireplaces and grills, cable TV hook-up, laundry room and plenty of trails and places to explore. Picture idyllic log cabins facing a placid lake. The sunrise fills your home-away-from home and you breathe the fresh air of pure paradise of the Niagara region of upstate New York. Whether you are looking to rent a cabin, set up your camp or RV, play in the water or just sit by the pool all day, this is one of the best campgrounds in a region that has activities for everyone. Families on a road trip, locals on a nature escape, and couples who are drawn to the nearby falls - it can become any trip you decide. With historic and personal connections to Colonial Williamsburg (the great grandfather and grandfather of the owners worked on the town's restoration in the 1930s), Anvil Campground is a great way for families to take in this unique corner of the country. Whether it's an educational trip around the colonial way of life in the historical town or a trip to Busch Gardens, one of the best theme parks in the country, this is a great place for families to stay. Warm nights and the sounds of nature around you allow for a direct connection to ancestors who stayed in the same region hundreds of years before you. Why Anvil Campground is a Top Campground: Amish-crafted model cabins are arriving in 2017 to accompany the RV sites and campgrounds. There is a swimming pool and playground for families. One of the best attractions is Colonial Williamsburg itself, which is a very short trip down the road. If that's a little slow for you, Busch Gardens is less than 10 minutes away. This is the kind of summer camp they make movies about. Any kind of coming-of-age, endless summer, fun-filled activity, rain or shine, is found at North America's only family-owned ACA accredited summer camp that is exclusively for teenagers. Whereas most summer camps are dedicated to keeping kids busy, Maine Teen Camp caters exclusively to teenagers who are asking bigger questions about growing up, life, who they want to be, and who they want to become. And at the same time, there are two lakes and endless activities. Why Maine Teen Camp is a Top Campground: Maine Teen Camp can rival most other camps with the number of activities they offer. Whether it is any sport imaginable on land or over water, creative arts and crafts, theater, fine arts, cooking, academics, day trips, night trips, games, leadership training or tutoring, it is a great place for young boys and girls to discover who they are and excel at what they love. One of the most popular campsites in the Midwest, Sauder Village is a retreat for couples, families, road trippers and RV trekkers who want to enjoy endless summer days filled with fun in the past at Ohio’s largest living history destination. Escape to nature, enjoy family adventures and relax in the country without having to travel far from nearby major cities. Whether you want to visit the Historic Village, play in the splash pad, start a basketball game or just escape with friends, family or a loved one, Sauder Village is a little slice of summer paradise in northern Ohio. Being lulled to sleep by the sound of crickets and pure natural paradise. Waking up to the site of the beautiful Kittatinny Mountain. Spending the day playing in the water, going for a hike, taking a bike ride or napping under the warm afternoon sun. The Triple Brook Camping Resort in Western New Jersey is a family escape in one of the most beautiful regions of the state. Whether you want to explore the nearby Delaware Water Gap, play in the water, relax in the sun or are even looking for an amazing wedding venue, Triple Brook is summer personified for the New Jersey and Pennsylvania region. Wake up with a light drizzle pattering on top of the canvas tent while you nestle into your queen-sized bed, staying warm. Spend the day drinking delicious wine, chatting with friends and getting away with a loved one at this unique glamping resort that is known as one of the most romantic places in Nebraska. With a tasting room on the property, wedding venue that is constantly in demand and some of the most unique and romantic accommodations in the state, Slattery Vintage Estates provides one of the most memorable camping experiences that you'll ever find. Where: Nehawka, NE, around an hour from Omaha and Lincoln, NE. Relax in your RV or under the warm canvas of your tent while families play on the seemingly endless number of playgrounds, water activities, games, sports and events that make this one of the most popular summer escapes in central Ohio. With a location in the heart of the Welsh Hills outside Columbus, Lazy River has something from campers of every age. You'll find a swimming pool, challenge course, laser tag, BMX track, mini golf and zipline for the kids (and youthful adults). Meanwhile, parents get to chill away from the noise by sitting by the pool, enjoying nature and just having a fun, family getaway that caters to families and their four-legged friends as well. Think of the greatest educational and fun-filled retreats in the world, apply that to everything you can do with your four-legged friend, and you have Camp Dogwood. Offering everything that a dog and companion can want in a getaway, there are few experience that match the bonding that you and your furry friend will have during your stay. Completing catering to the best experience for your dog, you will find every kind of training, sport and challenge course while taking advantage of the educational component of your stay. Learn more about your dog and how to bond, communicate, and strengthen your connection so that everyone's tail will be wagging by the time you depart. When the hot Utah sun sets, the desert comes alive. You get to experience the brightest night sky of your life as the Milky Way arcs across the horizon. Moab Valley and Archview offer the best way to bring a full day of Utah adventures to a close. Whether you are looking to explore some of the coolest caverns and trails in Canyonlands or take in some memorable pictures of Utah's famous natural arches, you'll rest easy after a full day of exploring. 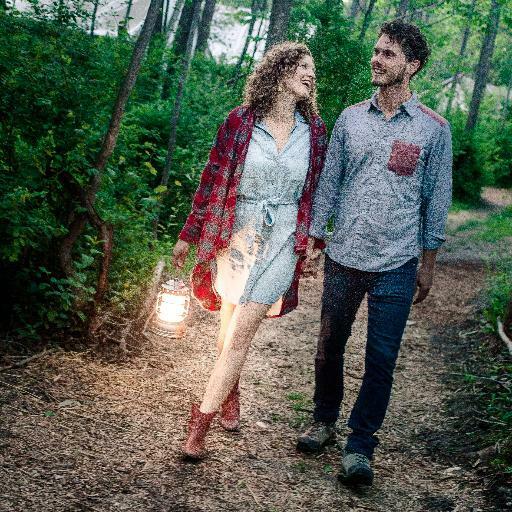 Featuring tent sites, teepees (only for character), RV camping along with glamping cabins and cottages, this is the perfect stop for couples, road trippers or even people looking for an unforgettable wedding venue. Why Highway West Vacations is a Top Campground: Easy access to Arches and Canyonlands National Parks, dedicated tent sites along with glamping cabins. Also, 5 casitas added in a western village at Archview this year. Looking for an RV park that will provide the perfect jumping off point to the best of California wine country? Vineyard RV Park is a 30-minute drive from Napa, California, located near the world-class wineries that Napa and Sonoma have to offer. Go on a tour for the day and explore the beautiful rolling hills while tasting some of the best varietals that the state has to offer. Or purchase a bottle or two and bring them back to your beautiful campground, kick back under the stars and hang out with friends. There are very few campsites in the world that offer this kind of relaxation and convenience amidst one of the best wine countries. 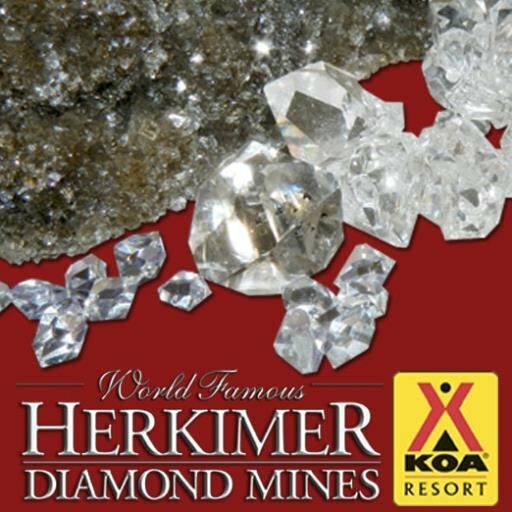 Offering every type of campground accommodation from tent and RV sites to cabins and themed specialty lodges, Herkimer Diamond Mines KOA further sets itself apart with its stellar riverfront location directly across from the mines themselves. Offering some of the best bass fishing and tubing in the region, you can spend hot summer days cooling off in the river or explore a quartz and diamond cave at your own pace. Attend Rock & Gem camp or check out the largest jewelry store in the region. There are few other sites that offer the best of camping along with history, exploration, waterfront activities and education with a touch of jewelry shopping in between. 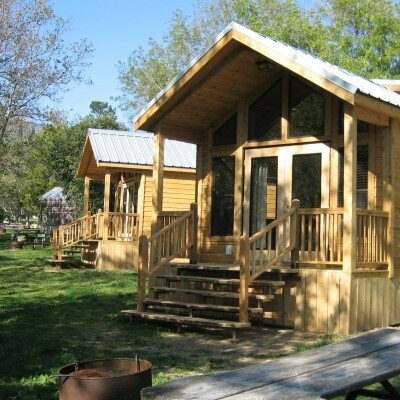 El Capitan Cabins offers everything that's great about Southern California and packs it into a top-tier glamping and camping resort. The resort maintains a car-free atmosphere & once you have unloaded your belongings at your accommodation, you must move your vehicle to a designated parking area. El Capitan will pack your stay with every kind of activity you could want. Take the ten minute walk to the beach and enjoy the waves splashing over you on the Pacific Ocean. Explore one of the numerous hiking trails that overlook the Santa Barbara mountains, Pacific Ocean and the campground. Or just kick back by the pool while the kids enjoy the playground and endless lawns for sports. There's nothing else like it in Southern California, and you'll feel like you're worlds away. The fresh smell of pine trees filters through your lungs as you get to take in some of the most beautiful mountain air in the Southern Appalachian mountain range. Ash Grove Camping offers seclusion, hiking, mountains and nature for any kind of camper ranging from families through solo getaways. It has the remarkable location of being within arm's reach of Great Smoky Mountains National Park, Nantahala National Forest, Chattahoochee National Forest and Pisgah National Forest. 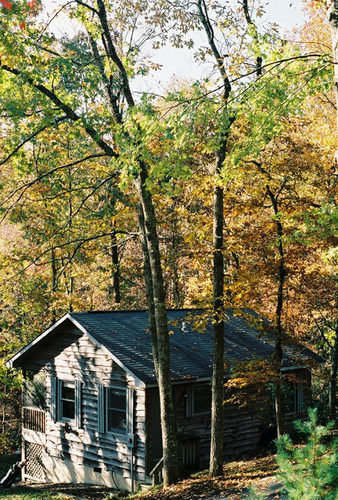 It's within a couple hours' drive of Atlanta, Charlotte, and Chattanooga and offers pristine campsites and cabins tucked away amidst soaring trees and raging waterfalls. Lake Tahoe is hands-down one of the best attractions in the entire state of California - and with good reason. Whether you are looking for an unlimited number of activities on one of the largest lakes in the country, looking to take a boat out for the day, want to check out the nearby casinos, or take some of the best hikes in the world, Camp Richardson makes all of that possible. It does so at a fraction of the price compared to the local hotels while providing an activity-packed get-away for the entire family. Whether you're looking for fun in the sun, getting out on a boat or loading the kids with memories, this campground has a stunning location and everything you'd hope to find an a campground. A campground and RV park that speaks to adrenaline seekers, dirt bike and ATV enthusiasts, Mines and Meadows is unlike any other campground in the country. Featuring over 75 miles of trails over 657 acres, you can spend all day roaring over an extensive trail network with friends and families and then relax in a campsite along the property. 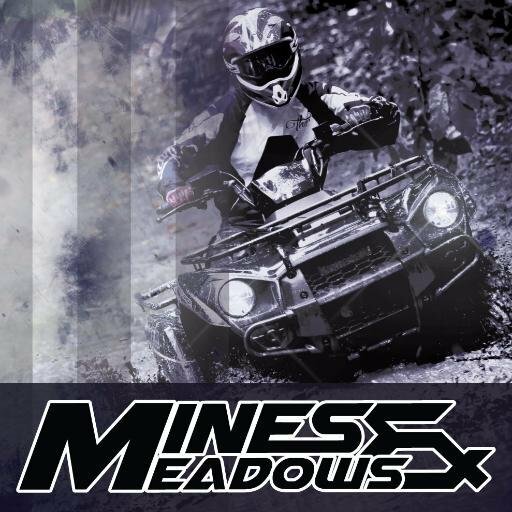 On top of that, Mines and Meadows is famous for underground riding through an abandoned mine. It's the perfect place to go if you're looking to haul your four-wheeler or bike on an RV. You can spend all day getting your adventure fix and then share some drinks and delicious food by a campfire at night. Then wake up and start all over again. The site features rentals and safety training for racers and riders of all ages and experience. The sun starts to set on the beautiful red rocks of the Utah desert. You had a full day exploring the soaring, sun-soaked arches that rose overhead at Grand Staircase-Escalante National Monument and the magnificent spires of Bryce Canyon National Park. Now it's time to take in a campground, RV park and airstream trailer unlike anywhere else in the country. 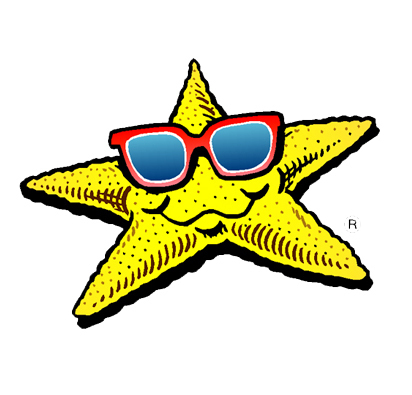 That's thanks to the star-studded Shooting Star RV resort in Southern Utah. Take in an outdoor movie, enjoy a movie-star themed airstream trailer and relax under a sky full of stars. It is the perfect combination of nature, quiet, peace and love for cinema that's great for couples, road trippers and families. Think fiery sunsets, endless beach days, the best of RV camping with easy access to San Diego, theme parks and hiking - and you have Paradise by the Sea RV Resort. North County San Diego includes some of the best beaches along the entire Pacific Coast and Paradise by the Sea is the only RV resort in the vicinity. It gives you the best of oceanfront activities at an affordable price with no shortage of activities. Hike or golf along Torrey Pines, take the kids to one of the many theme parks in the area, take a sunset cruise out on the Pacific or just sit by the beach all day. There's no shortage of ways to enjoy every slice of paradise while enjoying the best of Southern California RV beach camping. You're surrounded by an expanse of trees in every direction. You have at your disposal hiking trails to beaches, conservatories, shopping and a resort while being in one of the most secluded and relaxing parts of the country. Located near the furthest end of the Door Peninsula in Eastern Wisconsin, Wagon Trail Campground boasts and unparalleled level of seclusion and comfort that is very different from the more common, open plain RV sites. Wagon Trail puts the focus on campers and nature, ensuring that guests are connected to the beauty around them while having a memorable stay with excellent facilities and attention to detail that sets it apart from the competition. Racking up a trophy case of awards for best RV Park of its size and class from numerous publications several years running, the Barefoot Bay Marina & RV Resort has everything you could want from an east Texas getaway. Whether you want to chill at the RV park, campground or one of the fully-furnished cabins, you'll find the perfect accommodation for your stay. During your time at Barefoot Bay, you can enjoy a summer full of events with plenty of concerts and visiting bands. There's a sports bar and grill on site and all of that is before you get to the local activities, riverfront fun, paddle boats, mountain bikes, hiking trails, game room, beach volleyball and fishing that you'll be spend every day enjoying. Visitors flock to Barefoot Bay for the annual Kids Fishing Day, Wine and Art Festival, and Pioneer Days. It's a great spot for families or friends looking for a perfect slice of award-winning Texas camping. With unlimited daily activities for kids, rainy day back-ups, themed weekends, swimming pool and short drive over to Morey's Piers, Wildwood and one of the best parts of the southern Jersey shore, this eastern seaboard escape is unlike any other RV park in the region. This is one of those places where you get to decide the trip you want to have. Kick back and relax while the kids are entertained from sun up to sun down, take the whole crew over to the shore to play in the warm summer water of the Atlantic or play in the pool. There is everything from candy bar bingo, hayrides, to ceramics and arts and crafts. Everything you would want from summer camp for the whole family and the best of Southern New Jersey at your disposal. 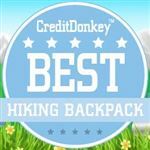 Share on Facebook "Best Campgrounds"